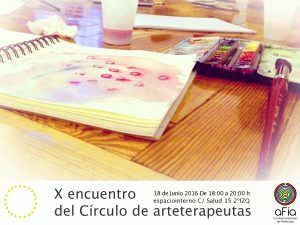 Os invitamos a esta particular jornada en la que vamos a tener con nosotr@s a Paz Corrales y luis Formaiano que nos van a presentar interesantes casos clínicos abordados desde el arteterapia y la experiencia artística y reflexión personal, sobre un proceso de enfermedad y lo que a través de la creación nació de esta vivencia. Identity, personal satisfaction and personal feeling of perfection of a person depend on his or her contact with nature (Wilson 1984). The internal need to be connected with nature and a conflict with real isolation may be expressed in psychological, physical or behavioural problems, which are described by Richard Louv (2005) as a phenomenon called “nature deficit disorder”. Creative activities and the possibility to be in contact with nature and explore it actively help children to gain balance again, reduce fears, work on the self-image, and increase autonomy and independence (Ferrini, 2003; Winnicot, 1971; Kellert&Derr, 1998; Berger, 2004). It is possible in therapy to create parallels between a person’s inner self-scenery and external natural environment. Natural resources can be used very well for activating senses (Henley, 1992: 157).The materials have different potential, application limits and conditions and potential outcome.Natural materials are not part of traditional means of art, they have their own history and environmental background.They enable to create a three-dimensional work of art, a mini model of the environment. They can be selected, put in order, processed (just like situations in life and feelings), and by doing this you gain self-confidence for making choices and decisions important for you (Seiden, 2001).The art therapist’s conception of the use of materials is an extremely important part of professional identity (Moon, 2010: 50).Through materials selection art therapist can guide therapy process. 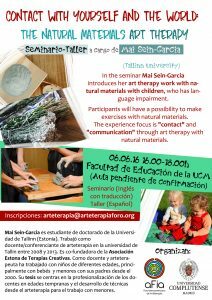 In the seminar Mai Sein-Garcia introduces her art therapy work with natural materials with children, who has language impairment. Participants will have a possibility to make exercises with natural materials. The experience focus is “contact” and “communication” through art therapy with natural materials. More information: www.pronatmat.eu; Sein-Garcia, M.; Rüütel, E.; Scotti, V.; Hentinen, H.; Tartes-Babkina, H. Vahtrapuu, A. & Ratnik, M., 2012; Sein-Garcia, M., Tavasti, A. & Ulkuniemi, S., 2012; Sein-Garcia, M. & Ulkuniemi, S. 2012; Sein-Garcia, M; Vahtrapuu, A.; Rüütel, E.; Tartes-Babkina, H.; Scotti, V.; Hentinen, H. ; Ratnik, M., 2012. Mai Sein-Garcia is a PhD student at the University of Tallinn. She worked as a lecturer of visual art therapy at Tallinn University in 2008-2013. She is a one of founder of the Estonian Association Creative Therapies. As teachers and art therapist she has worked with children of different ages, but especially with babies and toddlers and their parents since 2000. His thesis focuses on her early childhood teachers’ professionalism and the art therapy techniques in the use with young children. Ferrini, F. (2003).Horticultural therapy and its effect on people health.In Advances in Horticultural Science.Chapter 1 Conference International Society of Arboricolture. Henley, D. R. (1992).Exceptional children exceptional art: Teaching art to special needs. Worcester, MA: Davis. Kellert, S. &Derr, V. (1998).National study of outdoor wilderness experience.Washington, DC: Island Press. Louv, R. (2005). Last Child in the Woods Saving Our Children from Nature-Deficit Disorder.Algonquin Books of Chapel Hill, New York. Seiden, D. (2001). Mind over matter: The uses of materials in art, education and therapy. Chicago: Magnolia Street. Sein-Garcia, M. & Ulkuniemi, S. (2012). Natural materials for small children in the activities with hands and ecological art education. In Päivi Simi &OutiTuomela (Eds. ).Promoting Natural Materials.Turku: Turku University of Applied Sciences. Sein-Garcia, M.; Rüütel, E.; Scotti, V.; Hentinen, H.; Tartes-Babkina, H. Vahtrapuu, A. & Ratnik, M. (2012). Materials and natural materials in art therapy.In Päivi Simi &OutiTuomela (Eds. ).Promoting Natural Materials. Turku: Turku University of Applied Sciences. Winnicott, D.W. (1971). Therapeutic Consulations in Child Psychiatry. London: Hogarth Press. 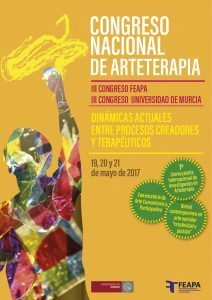 Un encuentro abierto a profesionales relacionados con el Arteterapia. Un espacio de apoyo mutuo, vivencial y semiestructurado, en el que compartir experiencias y recursos, generar redes y acompañarnos en este bonito y a veces difícil camino de ser arteterapeutas. El décimo encuentro lo llevará Alba Martín De Villodres. Será necesario llevar al taller algún material con el que sentirnos cómodos para trabajar plásticamente. Para aquellas/os que no habéis venido nunca sed bienvenidos puesto que cada encuentro es único y diferente y para que aquellos/as que repetís será agradable volver a veros. El Congreso pretende ofrecer un marco adecuado con una doble voluntad. 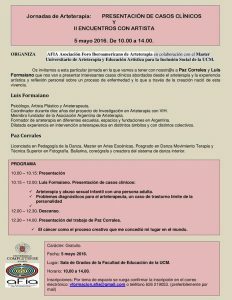 La primera es que pueda articularse como un punto de encuentro entre profesionales, así como de intercambio y reflexión crítica y la segunda de difundir entre otros profesionales lo que propone y aporta el Arteterapia en sus distintos campos de aplicación.